When I’m on a photo safari, Lions are the animals I spend the most time with by far. This is for many reasons but the main one is that it’s hard to to get a great shot of a lion. They are the laziest creatures on earth, well at daytime at-least anyway. 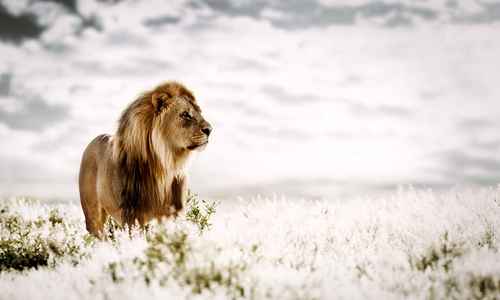 Lion images are the most sought after in the world. Everything from Lion HD wallpapers, to lion cartoons to lion paintings and so on are available en-masse out there, but I always found that no one really captured something that intrigued me. This was my motivation to take a trip to Namibia and see what I could do. Up until this point I was a fashion and stock Photographer working mostly with models and a crew. i was quickly introduced to the world of the lazy lions and how they differ to an eager Model. Nonetheless Lions make up the bulk of my fine art photography collection by far and it’s for that reason (and maybe a few more) that my art collection is in fact called the Pride Of Africa. Please enjoy this article of some of my Lion memoirs from the passed years as a wildlife photographer. On this trip to Namibia I got a couple of really nice images of all sorts of African Wildlife, but one image in particular stood out. 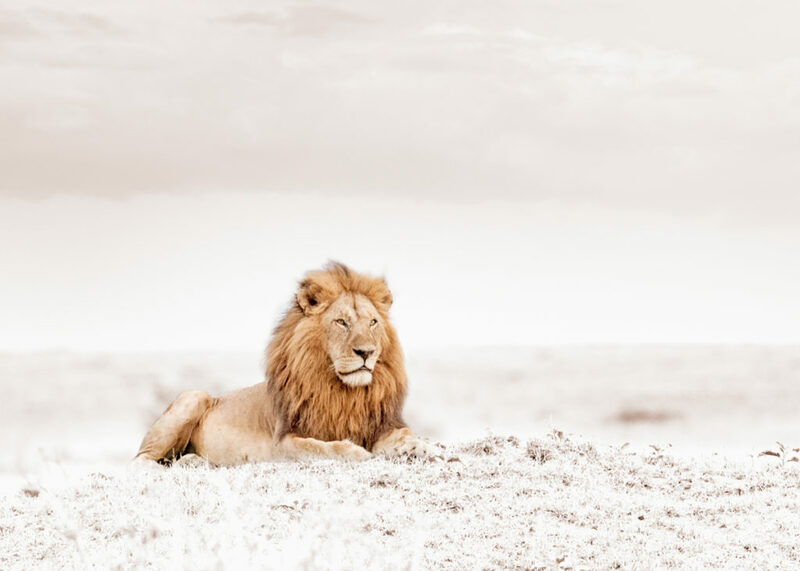 The image is a male lion standing and staring off into the distance – as proud as can be. It was simple and powerful. It didn’t require action or anything wild to make it appealing. The most important characteristic was his pride. I thought the most suitable title for this image MUST be Pride of Africa. When I returned home I decided to show this image to a good friend of mine who just so happens to own his own gallery, be an art collector and be a photographer himself. I arranged a meeting with Martin Osner. We did a test print and in that moment we both new something was here. Something different in the Wildlife Fine Art World. Many fantastic photographers already had a unique style, and now so did I. Martin told me that if i returned with more images like this he would grant me a solo exhibition. Well as they say the rest is history and to this day my work is available to see and buy at the Martin Osner gallery in Cape Town. It’s incredible how one single moment can change your entire life. This lion picture certainly did that. I left the fashion and stock photography world and went on a quest to become a full time Wild Life Photographer. 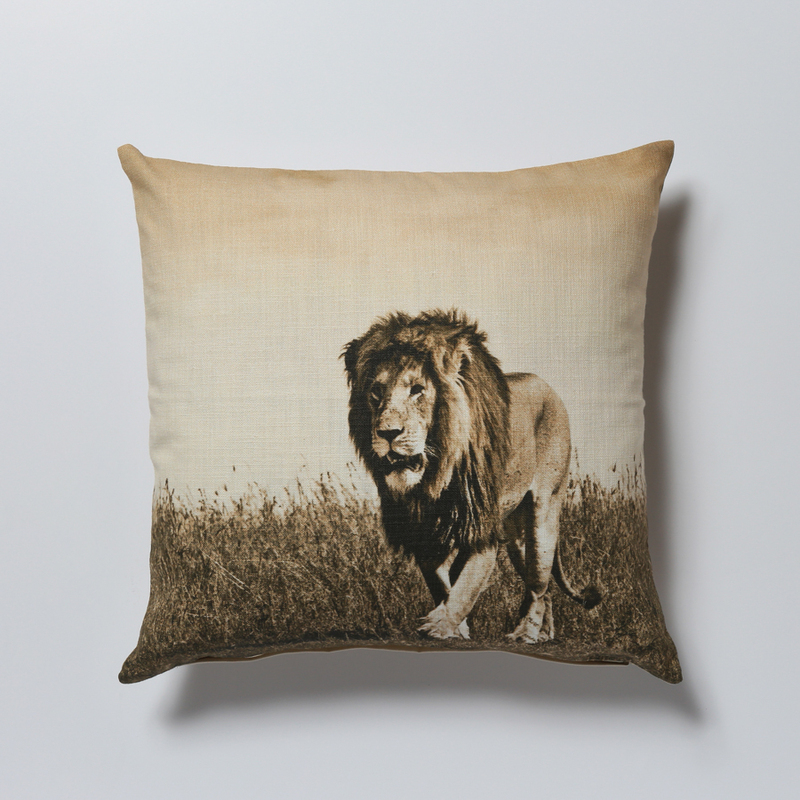 Read more about the back story and see the print options for “Pride of Africa”. Lions are heavy, muscular cats. They have a sturdy head and neck with round ears. Of all the cats its the most famous, well recognised and idolised (expect for maybe the Tiger in India). Lion males are larger than females weighing about 150 to 250 kg. Females are 120 to 182 kg and usually hunt in groups. Their prey varies widely depending on where they are and what situation they find themselves in. Most of the time they will hunt antelope, but are known to take down bigger prey such as buffalo, hippos and even (but rarely) an elephant. Lions are the top of the food chain – also known as an Apex predator, although they scavenge from time to time. This does not always mean their life is easy. Often going through long periods of not eating and rivalry within the pride, with other prides or other animals like hyenas keeps them in a constant mode of alertness. 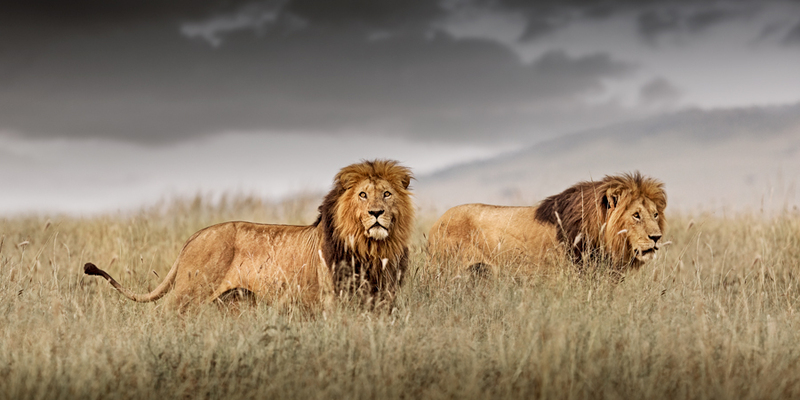 Young energetic males will often roam the grasslands of Kenya together like cheetah brothers. But in a Pride, often there will be one alpha male along with a couple of “submissive” males. If the alpha is pushed out by a new one he may turn to a life of solitude. Lions are enchanting. Although they can drive you nuts as a photographer with their endless sleeping, when a good shot does present itself its like scoring a goal in a final game match. 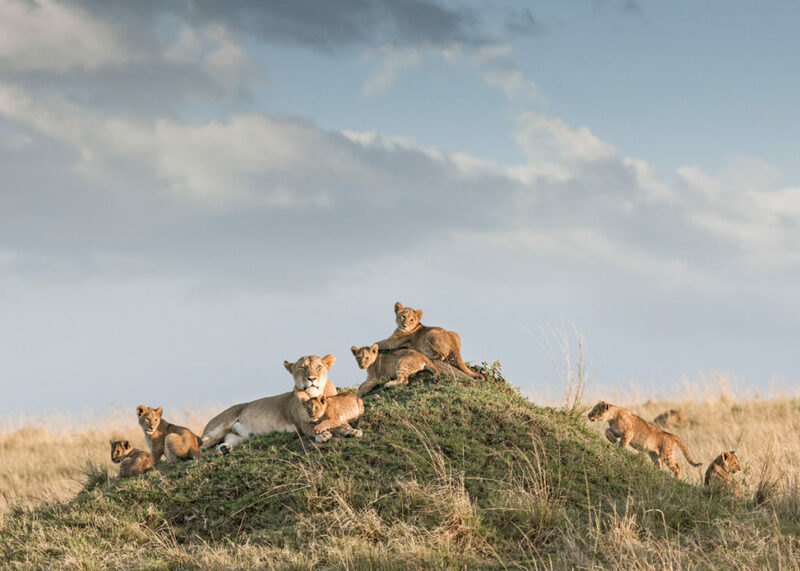 When I’m in the Maasai Mara I will try and leave camp in the dark and find a pride of lions before first light. Very often they will be snoozing with full bellies from a busy night of hunting. Within a few minutes it’s all over and the lions are in the bush – sleeping. The next opportunity will be this evening again when it cools and they start to stir for the nights activities. This gives you some insight into how to get the best lion shots. I didn’t know this in the beginning and often spent hours waiting aimlessly. This is why its always good to have a guide that knows these animals very well. john and I have had many great lion stake outs (no not the meat) together and ultimately they they turned out to be worth wile. 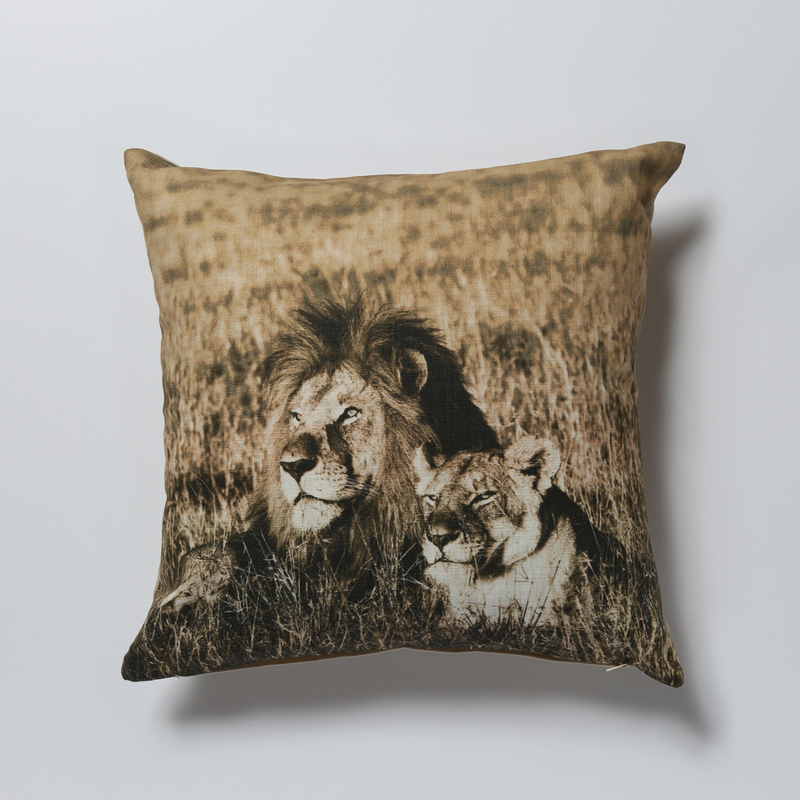 In the Pride of Africa Collection you will notice 3 distinct Lion images. There are the Male Lion Photos, the Female Lion Photos and the Images with lion cubs. All of these have a different look and feel which is often pointed out by the titles i have given my lion images. Cubs often associated with “innocence”, females with “cunning” and males with “pride”. These are the elements that make up the heart of the Klaus Tiedge Lion Fine Art collection. The two lions greet each other extensively as if they haven’t seen each other for a long time. Then, they walk off side by side, clearly having a plan in mind. That was the moment. Wildlife Photography has changed my outlook on African Wildlife. I always just thought it was something to look at and appreciate. But when you spend so much time with wild lions, the kings of the jungle so to say you get an even deeper respect for nature and life. Their family bonds and narratives are like part of my story. I have followed lions through generations now. On my first trip I photographed a famous lion named Notch (who has since passed away) and on my most recent rip i got to spend time with his sons. It’s incredible to see their bloodlines and personalities develop. I feel truly humbled to have had these experiences and capture them. Just ahead of nightfall and a gigantic thunderstorm i managed to capture this image called Last Light. It is one of my favourites in terms of lion image but also from the memory of being there. Ladies on the Prowl. 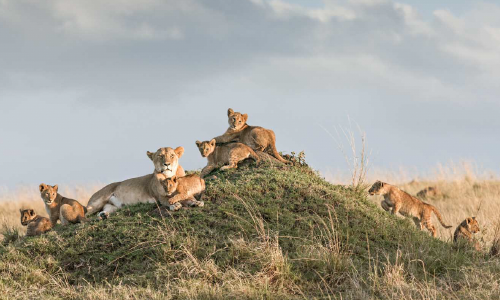 This group of female lions had just gotten up getting ready to circle the prey that was behind me. This image is called Spirit of Discovery. In this video I tell the back story of the image alongside: Spirit of Discovery. 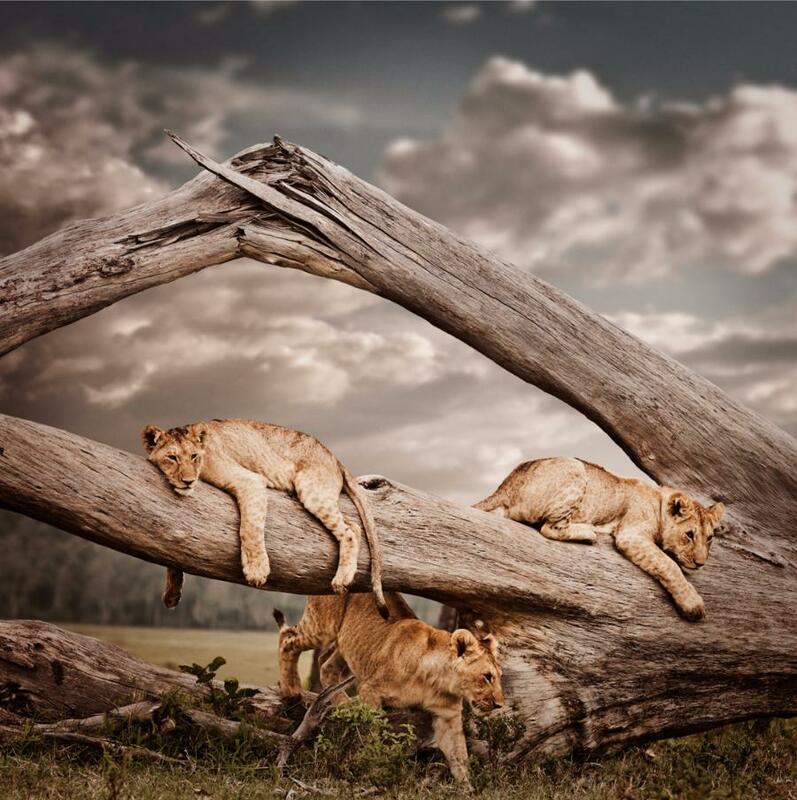 The 3 lion cubs – each with its own personality, playing on an old tree in the Maasai Mara. Below are a collection of my open edition prints. Because there is no limit to the number of prints the prices are lower and these images can be used in other applications such as bags and pillows for example. 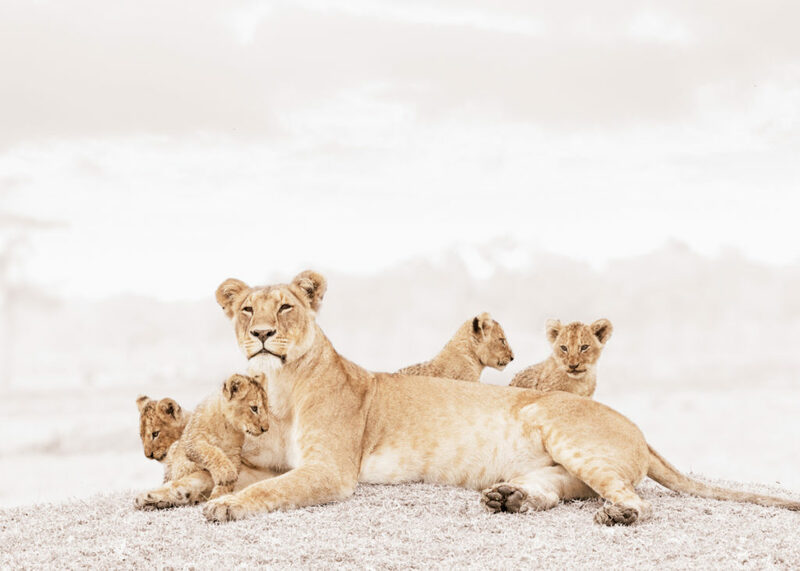 These Lion Prints are from the “white collection”. 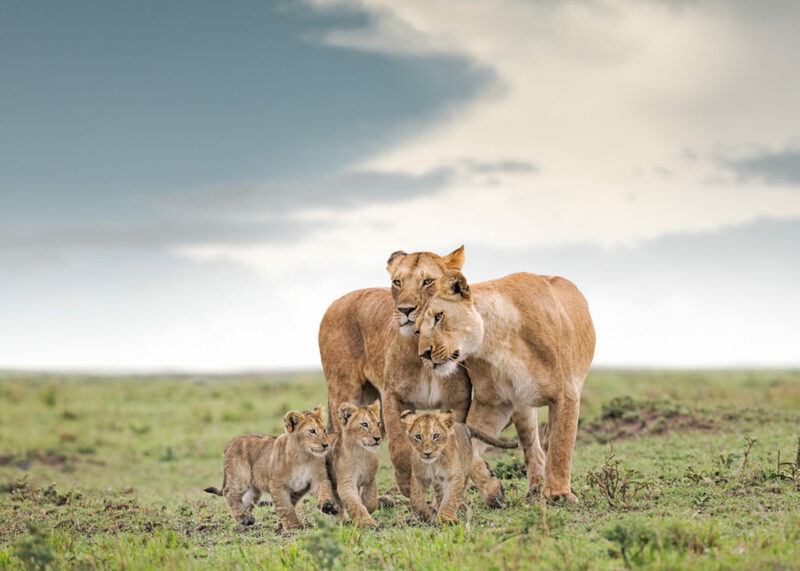 I hope you enjoyed learning more about my Pride of Africa Lion Pictures. Please leave a comment or a personal story of your favourite Lion encounter below. I’d love to connect with you.